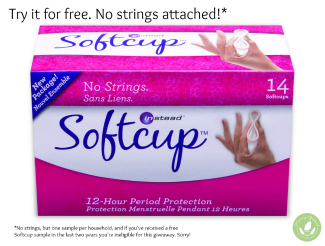 When I wrote about Softcup’s menstrual cup last year, I had NO idea the amazing response the post would get. More than 200 of you entered to win a year’s supply of reusable cups, and we had a full-on debate going on in the comments section. What’s the consensus? With 12-hour protection that’s totally undetectable, the Softcup menstrual cup is a win! So when the company asked if I’d like to give away some free disposable Softcup samples to my readers, I jumped at the chance. Now through May 21, 2014 Click here to get your free disposable Softcup sample. Supplies are limited: Get one today so you can try it the next time Aunt Flo comes knocking. It’s a game-changer! This post was sponsored by Softcup and meets the standards I’ve established to endorse a brand as “Mommy Greenest Approved.” Click here for more about Editorial Standards. The sample offer is over, I’m sorry Amanda. I know that the reusables are sold in many stores; check the Softcup site to find one in your area or you can order online. Good luck! I have never heard of the soft cup. I just recently became very interested in tryin a sample, but it says that offer is expired. How can I try these.??? They dont sell them in stores around here. Yes, go to http://www.softcup.com! They’re awesome! Hi Rachel! I love that you’re promoting a non-toxic was to manage that time of the month! I have to add to your article that once ladies give these a try (and I really hope they do), try a silicone menstrual cup. I did this transition myself and I must say I was almost put off by the ring/bag arrangement. I’m so happy with my decision to get the Moon Cup that I will never go back to tampons!!! Also, I do still use pads on occasion around the first few days of ‘the visit’. I just purchased some cloth reusable ones that I can’t wait to try. Yes, it is, absolutely! Thanks for taking the time to share your valuable perspective, Amy! Hi, I’m also having trouble signing up. Thank you so much for looking into the error! Same here, says I entered the maximum number of times (2) after the first attempt! Okay don’t worry we’ve got you covered!! Hello! I got a message that I had signed up the maximum of 2 times already, on my first visit to the website. It’s 9:52 PM EST and the form still isn’t working. Shame on them! Hi! It still won’t let me sign up. It says I already signed up. Me, too. Had a message about signing up twice already – definitely my first try. Hey there is still a problem. I was trying to sign up but it doesn’t let me. Okay ladies, there is obviously a problem here! I’m going to make sure you get your samples, no worries! If you have problems entering just email info(at)mommygreenest.com and we’ll get it sorted out. Sorry for the inconvenience! Okay this should be fixed now, ladies! Sorry about the snafus for some of you! Still had it say I’d entered the maximum number of times (twice with one click?!). Drat. Had the same message when I tried. We are looking into this right now with Softcup! So sorry you guys!! It still doesn’t appear to be working. It tells me that I have submitted two times already. The link says I already signed up. I haven’t! Boo. Oh no! Do you want to try it again? Email info at mommy greenest dot com if you are still having trouble!